Recipe To Be FIT: NEW YEAR, NEW YOU!! January Sales!! There are some pretty awesome promotions going on this month, Beachbody is doing everything it can to set us up for success in the New Year! 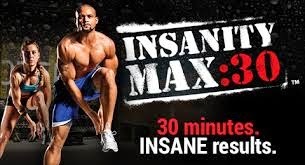 Insanity MAX:30 has bringing people to a new level of fitness since its release last month, and now they have extended the Challenge Pack sale through the month of January. It is on sale for $180 (normally $205). For those ready for the challenge, note there is a modifier in EVERY video! 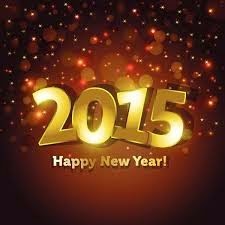 If you want to MAX your fitness in 2015 you can get yours by clicking the link below! The 21 Day Fix has been helping people achieve their goals, and bringing them amazing results since its release this past February. With the new 21 Day Fix Extreme scheduled to be released next month, we are discounting the price of the fix challenge pack to $140 in the month of January. This program makes the nutrition part that so many people struggle with simple, in my opinion that is why so many of you have seen success! Basically you get an entire workout program, and meal portion container system, and month of shakes for just $10 more than you would normally pay for a month of shakes. AWESOME DEAL! If you want to take advantage of the 21 Day Fix Promotion, click the link below! For those of you who are not looking for a fitness program, but want to cleanse your body of the cookies and alcohol from the holidays, we have the 3 Day Refresh Challenge Pack. I have done this cleanse 2 times since its release in June, whenever I need a refresh, and have always seen some great results. My challengers usually see a 5-10lb weight loss, and inches to match! A day on the reset includes: 1 Shakeology, 2 Vanilla Shakes, 2 servings of Veggies, 2 servings of Fruit, 2 servings of healthy fats, and several given choices for dinner. SO EASY!! 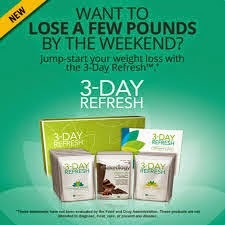 For the month of January the 3 Day Refresh will be on sale for $140. I have personally seen great results with this cleanse, if you are wanting to refresh in 2015 you can do so by clicking the link below! 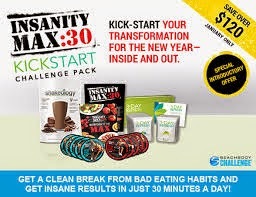 Beachbody is introducing a NEW Challenge pack this month, The Insanity MAX:30 Kickstart Package! Basically all the good things I said about Max:30 and the 3 Day Refresh apply here, but put them all together, add a bigger discount (you save $100), and this is what you get! This is perfect for those of you who are looking not only for a fitness program, but also a kickstart to your weight loss! If you want to start 2015 making some SOLID, good decisions, click the link below and get your MAX:30 kickstart challenge pack! I also have a challenge group coming up in the month of January(Jan 5th starts the week of pre season), to help you maximize your results with guidance, support, motivation, and accountability! If you would like to join that group, please write me back and let me know! I really want to help you all reach your goals in 2015, so I invite you to message me any time you need me, big or small!